You can easily order official Pilots For Kids merchandise by printing this page and mailing it to the address listed below! Proudly display your dedication to hospitalized children! All prices include shipping and handling. Please make checks payable to Pilots For Kids. A 1GB memory stick attached to a PFK lanyard. A blue rubber wristband sporting "Pilots For Kids"
Perfect for those hot or cold drinks on the go. Durable with removable lid. Customize your flight bag and luggage with our Pilots For Kids I.D. tags. Made of durable, "baggage handler resistant" material. 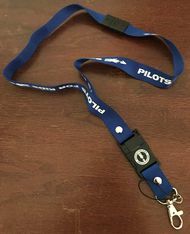 This bag tag will display your support as a Pilots For Kids member. Our logo is proudly placed on the front of the tag. The back provides a card for your name and address. A looped strap attaches the tag to your luggage. 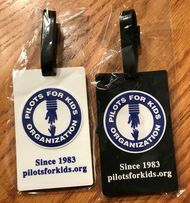 Order your tags, today, and show your support for Pilots For Kids. Tags come in a package of three. 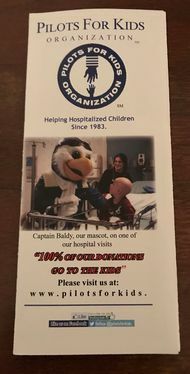 Brochure with pictures and descriptions of the Pilots For Kids organization. Jerzees polo shirt adds style on and off the golf course. Choose from blue, white or light grey. Order with or without a front pocket. Warmer climates will enjoy our new selection of T-shirts. Grey only with our logo. The ideal garment for any season. 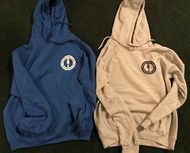 Choose your sweatshirt from white, light grey (with large PFK logo) or royal blue. Available only in blue with a convenient hood. Keep your head warm or the sun out of your eyes with a ball cap. Order with or without "scrambled eggs." You can order your PFK Merchandise by contacting Carol Stocker by phone at (440) 382-3090 or by email at merchandise[at]pilotsforkids.org. Please make sure to include your mailing address, as well as an itemized list of items you wish to order. For your convenience, you may print this page and mark the quantity desired in the provided boxes.